Airwaves Ducati rider, Shane Byrne headed the field in the final warm-up for today's British Superbike race at Brands Hatch. Setting a best time of, 46.283, Byrne was 0.142s quicker than Rizla Suzuki's Tom Sykes, who's best lap was 46.425. The HM Plant Honda fireblade's of Leon Haslam and Cal Crutchlow rounded out the first row, closely followed by the Ducati's of Leon Camier and Michael Rutter. James Ellison was seventh fastest, posting a time 46.885, and Tena for Men Honda's Tristan Palmer was the last rider to get inside the 47s bracket, with a 46.921. Jon Kirkham, who replaces the absent Karl Harris was unable to better his qualifying position from yesterday, and dropped to 12th position behind Rizla Suzuki's Atsushi Watanabe, with a best time of 47.428. 1. Shane Byrne Airwaves Ducati 46.2832. Tom Sykes Rizla Suzuki 46.4253. Leon Haslam HM Plant Honda 46.6154. Cal Crutchlow HM Plant Honda 46.6405. 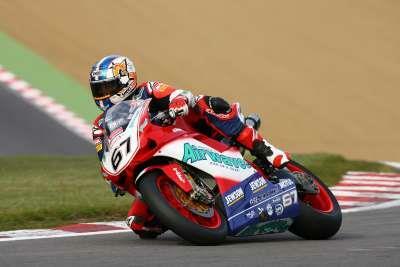 Leon Camier Airwavews Ducati 46.6796. Michael Rutter North West 200 Ducati 46.7857. James Ellison Hydrex Bike Animal Honda 46.8858. Tristan Palmer Tena for Men Honda 46.9219. Simon Andrews Lloyds British Jentin Yamaha 47.00810. Gary Mason Quay Garage Honda 47.03611. Atsushi Watanabe Rizla Suzuki 47.11912. John Kirkham Rob Mac Racing Yamaha 47.42813. Stuart Easton MSS Discovery Kawasaki 47.25714. Michael Laverty TAS Relentless Suzuki 47.35015. Billy McConnell MSS Discovery Kawasaki 47.38016.